The following first glance at trying to start to get at what these designs meant focuses on the possibility of eclipse symbolism and the vague notion of a 'Monastery of the Solar Eclipse' . . . However, the variety of diamond designs on show at Brodgar, and related sites in Ireland, suggests there may have been layers of meaning involved in this device. So while it is appealing to look at connecting the Atlantic Culture's symbols to a clear and impressive natural phenomenon, there are other options and these may not be mutually exclusive. The Only Diamond in Ancient Scotland . . .
Where and when (in largely diamond free and definitely cut diamond free Neolithic Scotland) could you see a lozenge shaped diamond shining while bathed in fire - comparable to the fireside motif found at sophisticated Neolithic ceremonial centre Ness of Brodgar earlier this week? The Diamond Ring Effect of a full solar eclipse is the only obvious one I can come up with . . . and given the regional Neolithic astronomy and likely calendar skills posted earlier it would be remarkable if eclipses were not considered significant on some level. In addition, there's a 'preoccupation' at Neolithic Brodgar with diamonds on the pottery, structures and artwork - all using designs exported and developed across Britain and Ireland. Which suggests the carved diamonds 'on the ground' were considered laden with some sort of meaning or message of great import. However, that doesn't get us to any kind of definite answer. More a case of comparing what is slowly appearing from the ground with interpretations, which include the theme of an ancient landscape where the idea of 'conjunction' or drawing the community together focuses at Ness of Brodgar. There's a vast amount more to dig up at Ness of Brodgar, and over in Caithness, over many years ahead before material evidence drills right down into the culture and the extraordinary, but not wholly unique, development of the culture, (well at least two cultures as it happens at one stage on Orkney - living side by side with different customs). This is a pattern found in many proto-civisations where a series of inputs come together and quite rapidly coalesce to facilitate rapid cultural development. I.e. it would be exceptional for a culture/ s at the level of Neolithic Orkney and Caithness to avoid elaborating systems of belief alongside systems of production. Proto-civilisations have a consistent habit of leaving records in symbol and stone. These may be very representationally different, but the underlying mental representations are based around a common cognitive topography. In other words, ideas common to human experience within such cultures are likely to underlie the particulars of the expression of those ideas. More tenuously, though perhaps not from the perspective of those at the time, the solar eclipse crops up frequently in ancient cultures as a metaphor for various forms of unity . . . the reconciling of opposites - with the diamond ring effect styled as the point of absolute union. Figuratively sublimation forming a third component at the point of balance, where the sum becomes more than the parts. Why is a full solar eclipse generally such a big deal - beyond the importance of calendars to putting lunch on the table. It demonstrates a capacity to predict precisely over generations and the means to influence planning on the basis of measured predictions . . . proto-science. The 'science' is technically crude compared to the Hubble telescope, but very practical/ immediate in the minds of those involved as a means to introduce structure and regularity across social systems. Altogether perhaps quite an appealing prospect in a transient world where there were countless uncertainties; few options for seeking explanation; and you were always only a broken leg away from a potentially painkiller free death. As for possible eclipse symbolism. This is the exact description of the archaeologist uncovering the 'diamond in flame' motif in 2016. There is no mention of eclipses, so I'm more noting something for following up than suggesting there is anythign approachign definite. "Over in Structure Fourteen – one of the smallest buildings on site and one heading towards the end of its excavation life – final work was taking place today on the hearth at the south end, under the direction of supervisor Dave. Extensive archaeomagnetic sampling in the area had already been carried out by Sam, but the actual emptying of the last quarter of the hearth was Paul’s task. His sharp eyes noticed that one of the hearth slabs had a large lozenge shape incised into it on the side facing inwards. This means that the decorative element would probably have been brightly lit by the fire when in use." Since originally posting the piece above something obvious has become apparent. The key triple diamond logo appearing all over the site at Ness of Brodgar, which is also all over the pottery exported south and marked into the diamond shaped golden stomachers or breastplates worn/ buried with high status figures near Stonehenge, has later, distant identifications with solar eclipses and religious concepts like Ascension. What this says about Ness of Brodgar and its culture needs a lot more investigation, but here's the site plan of the 'domestic temple' at Ness of Brodgar slightly rotated. Fairly obviously, the central 'facility' at Ness of Brodgar, the very heart of this ancient complex appears to form a triple diamond motif matching the diamond or lozenge so much at the core of the art found in Orkney and later at Stonehenge. Coincidence - quite possibly and the shape could be explained as, perhaps, a stylised hearth. However, everything else about the construction of the Brodgar landscape and symbolism is very structured and uses impressive precision to direct attention to the monuments and their connects to sky phenomena. Nevertheless, this is speculation. Generally, the motif or logos is significant in terms of the Neolithic culture so connected to Orkney, Caithness, Ireland, England and back to Brittany. However, both the diamonds and the triple diamond start to pop up all over the place in later Pictish, Gael, Norse-Gael, Scottish, Scandinavian and Christian art. They were elsewhere in Europe during the Neolithic, but become a very persistent feature in cultures along the Atlantic Fringe. Among this there is some evidence that the device becomes strongly associated with solar eclipses/ eclipses and symbolism concerning, for example, Christian concepts including Pentecost and Ascension. Carrying on from there means working with sometimes problematic and/ or distant sources. It could be described as a bit of a fishing expedition, but if you don't cast the net perhaps something will get away. In addition, it brings up the Girl of the Wheat mentioned at the outset and a slight complication concerning dating. So, as earlier, not a bad place to take a break and to maybe return to when you've chewed over the discussion/ mix of evidence so far. Reproduction of the Bush Barrow Lozenge - a golden stomacher/ breastplate from the Stonehenge region. David Morrison (c) 2017. This text might suggest that literal depictions of solar eclipses would thus be required in all depictions of the crucifixion. However, in approaching art of this period, one needs to suspend the default image of the Moon crossing the face of the Sun. The artistic response in this period was rather more formal, theological and counter-intuitive to the modern mind. It takes unraveling too because it is heavy with symbolism and iconography. The related Scottish or Irish Insular illuminations also from the early medieval appear to take a similar approach to using art to depict the same concepts, but the lozenge or diamond sits at the centre of the illumination. Things may get a little closer to joining up when considering that Iona was a centre of the recording of eclipses in the early middle ages. "The Irish monastic annals preserve cryptic but accurate descriptions and chronological records of astronomical events from the fifth to the twelfth centuries; while in the first two centuries the records are mostly borrowed from mainland European sources, from 627 to 1133 the records are all of observations made from or near Ireland. Considering the distribution of the records, it is clear that lunar eclipses were subject to special interest in the eighth century, but in terms of totals however, apart from the peak in the eighth century there was a fairly uniform rate from the seventh to the eleventh century, followed by a decline until they cease absolutely after 1133, despite that fact that the annals continue in some cases until the seventeenth century with greatly increased coverage. 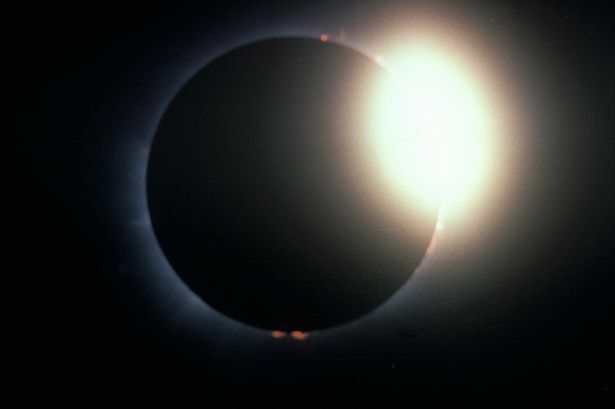 Examination of this astronomical material has resulted in new information relating to a number of events; we have shown that the path of totality of the solar eclipse of 1 May 664 passed over the monasteries founded by king Oswy in the preceding decade as part of his support for Iona’s mission to Lindisfarne. Re-examination of Bede’s account of events and Pope Vitalian’s letter to Oswy strongly suggests that it was this eclipse which precipitated the Synod of Whitby and frightened Oswy into switching his allegiance to the Roman church." Which gets us to Iona, but it appears the interest in conducting detailed observations from Iona and Ireland is only introduced to the record in the early medieval. So there is no clean join to an earlier tradition of diamonds representing eclipses and/ or being associated with some form of conjunction. There is, however, some indication in the quote of just how significant these events were in the minds of early medieval Scots. Folio 183r, Decorated text. Erat autem hora tercia. Is there a way to connect things up much further back? Reverse of Newgrange Entry Stone. Credit - Johnbod under Creative Commons Attribution-Share Alike 3.0 Unported. 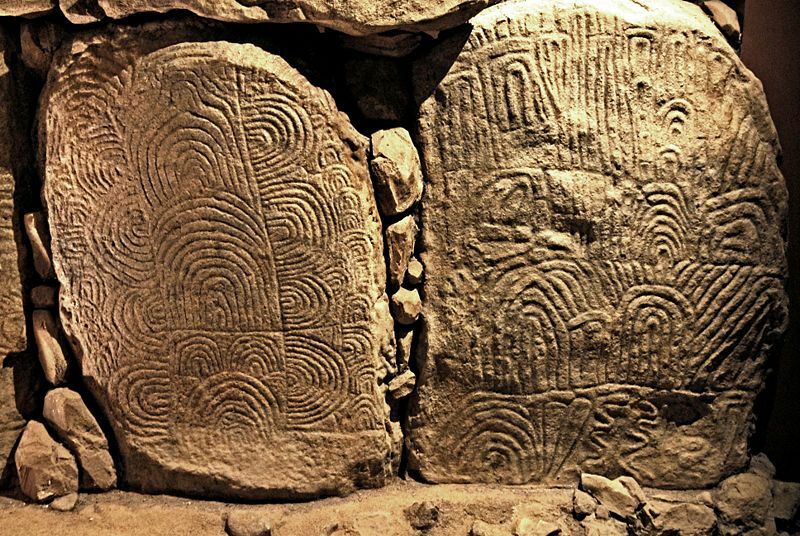 A look at some of the artwork very closely related to that in Orkney and Caithness reveals a parallel path in terms of some sort of early access to the megalithic architecture of the increasingly agricultural Brittany in the region of 4,000 BC. Sites like Table de Marchand in Brittany develop as comparable, but regionally distinct, sites gradually develop in Scotland and Ireland, e.g. the Camster Cairns in Caithness. The closest similarities of design and the most elaborate monuments then develop intensively from about 3,300 BC to arrive at a peak in 3,100 BC, (and something of a plateau for about a 1000 years in Orkney). The closest connections of development and design emerging at Gavrinis, in Ireland, in the Western Isles and in Orkney as a broad cultural horizon at roughly the same time. The many diamond designs carved at Ness of Brodgar have many similarities when compared to designs from Neolithic Ireland. The image above from Newgrange indicates how things get more complicated with the diamonds, double diamonds, triple diamonds, rows of diamonds and fields of diamonds found at Newgrange. There are a number of theories and speculations out there on the meanings of the symbols . . . and it's very tricky to sort out individual symbols let alone the entire set. One intriguing option is some sort of mapping of the monuments or sacred landscape itself, incorporating the ancestral landscape of cairns and standing stones alongside, or in correspondence, with tracking events in the skies. However, there is not any systematic or scientific account that's currently agree on. For example, Newgrange contains a proposed record of an eclipse from the relevant period in the form of two discs merging rather than diamonds. It's a compelling image and more than one representation of an event acting on different levels of understanding is not a problem of itself. However, where there may be some grounds for agreement, it has yet to coalesce. That said, in the case of the diamonds myth offers one possible understanding, which may help to offer some insight on the diamonds without going elsewhere. Possible solar eclipse related decoration/ ceremonies at Ness of Brodgar? Where next other than wait for more digging . . . check if there are any possible accounts, tales or examples of related concepts connecting the Atlantic Civilisation of the Neolithic Highway to eclipses. The first option here is tricky territory as we've plenty of evidence of basic astronomy being woven into myth in proto-civilisations. However, matching that to a specific phenomena is sometimes tricky and the outstanding early contributions of Hamlet's Mill and Jane B Sellars in this area still take flak as a result of begin hijacked and misrepresented in the 1990s. So I've found something intriguing, but it kind of sits at the edge of the board - particularly as there's a huge gap in time between Orkney/ the origins of Manannan and the recording of traditions in medieval times. That said there is substantial evidence of horizon astronomy in Scotland on many levels. On a much less scientific level, but consistent with eclipses and other astronomical information woven into folklore/ oral tradition: a tale from the early medieval Christianised Gaelic tales featuring the Sea God Manannan in one of his many roles . . .
"Gobhan the Architect and his son, young Gobhan, runs the tale, were sent for by Balor of the Blows to build him a palace. They built it so well that Balor decided never to let them leave his kingdom alive, for fear they should build another one equally good for someone else. He therefore had all the scaffolding removed from round the palace while they were still on the top, with the intention of leaving them up there to die of hunger. But, when they discovered this, they began to destroy the roof, so that Balor was obliged to let them come down. He, none the less, refused to allow them to return to Ireland. The crafty Gobhan, however, had his plan ready. He told Balor that the injury that had been done to the palace roof could not be repaired without special tools, which he had left behind him at home. Balor declined to let either old Gobhan or young Gobhan go back to fetch them; but he offered to send his own son. Gobhan gave Balor's son directions for the journey. He was to travel until he came to a house with a stack of corn at the door. Entering it, he would find a woman with one hand and a child with one eye. Balor's son found the house, and asked the woman for the tools. She expected him; for it had been arranged between Gobhan and his wife what should be done, if Balor refused to let him return. She took Balor's son to a huge chest, and told him that the tools were at the bottom of it, so far down that she could not reach them, and that he must get into the chest, and pick them up himself. But, as soon as he was safely inside, she shut the lid on him, telling him that he would have to stay there until his father allowed old Gobhan and young Gobhan to come home with their pay. And she sent the same message to Balor himself. There was an exchange of prisoners, Balor giving the two Gobhans their pay and a ship to take them home, and Gobhan's wife releasing Balor's son. But, before the two builders went, Balor asked them whom he should now employ to repair his palace. Old Gobhan told him that, next to himself, there was no workman in Ireland better than one Gavidjeen Go. When Gobhan got back to Ireland, he sent Gavidjeen Go to Balor. But he gave him a piece of advice--to accept as pay only one thing: Balor's gray cow, which would fill twenty barrels at one milking. Balor agreed to this, but, when he gave the cow to Gavidjeen Go to take back with him to Ireland, he omitted to include her byre-rope, which was the only thing that would keep her from returning to her original owner. The gray cow gave so much trouble to Gavidjeen Go by her straying, that he was obliged to hire military champions to watch her during the day and bring her safely home at night. The bargain made was that Gavidjeen Go should forge the champion a sword for his pay, but that, if he lost the cow, his life was to be forfeited. At last, a certain warrior called Cian was unlucky enough to let the cow escape. He followed her tracks down to the sea-shore and right to the edge of the waves, and there he lost them altogether. He was tearing his hair in his perplexity, when he saw a man rowing a coracle. The man, who was no other than Manannán son of Lêr, came in close to the shore, and asked what was the matter. "What would you give to anyone who would take you to the place where the gray cow is?" asked Manannán. "I have nothing to give," replied Cian. "All I ask," said Manannán, "is half of whatever you gain before you come back." Cian agreed to that willingly enough, and Manannán told him to get into the coracle. In the wink of an eye, he had landed him in Balor's kingdom, the realm of the cold, where they roast no meat, but eat their food raw. Cian was not used to this diet, so he lit himself a fire, and began to cook some food. Balor saw the fire, and came down to it, and he was so pleased that he appointed Cian to be his fire-maker and cook. Now Balor had a daughter, of whom a druid had prophesied that she would, some day, bear a son who would kill his grandfather. Therefore, like Acrisius, in Greek legend, he shut her up in a tower, guarded by women, and allowed her to see no man but himself. One day, Cian saw Balor go to the tower. He waited until he had come back, and then went to explore. He had the gift of opening locked doors and shutting them again after him. When he got inside, he lit a fire, and this novelty so delighted Balor's daughter that she invited him to visit her again. After this - in the Achill islander's quaint phrase - "he was ever coming there, until a child happened to her." Balor's daughter gave the baby to Cian to take away. She also gave him the byre-rope which belonged to the gray cow. Cian was in great danger now, for Balor had found out about the child. He led the gray cow away with the rope to the sea-shore, and waited for Manannán. The Son of Lêr had told Cian that, when he was in any difficulty, he was to think of him, and he would at once appear. Cian thought of him now, and, in a moment, Manannán appeared with his coracle. Cian got into the boat, with the baby and the gray cow, just as Balor, in hot pursuit, came down to the beach. Balor, by his incantations, raised a great storm to drown them; but Manannán, whose druidism was greater, stilled it. Then Balor turned the sea into fire, to burn them; but Manannán put it out with a stone. *- the above is where some possibility of a description of an eclipse might be recorded. Particularly, in respect of a stone set in a sea of flame. However, I hear any passing archaeologists' pain and if I hadn't been on such things for years would have thought little of the possibility. Don't have time to get back into the whole Scottish stone reverence thing that might hint at connecting a diamond shape set in flame to 'a stone'. Consequently, just leaving it there as the possibility that such texts may retain/ seek to pass on a certain amount of basic astronomical knowledge. Back to the tale . . . When they were safe back in Ireland, Manannán asked Cian for his promised reward. "I have gained nothing but the boy, and I cannot cut him in two, so I will give him to you whole," he replied. "That is what I was wanting all the time," said Manannán; "when he grows up, there will be no champion equal to him." So Manannán baptized the boy, calling him "the Dul-Dauna". This name, meaning "Blind-Stubborn", is certainly a curious corruption of the original Ioldanach "Master of all Knowledge". When the boy had grown up, he went one day to the sea-shore. A ship came past, in which was a man. The traditions of Donnybrook Fair are evidently prehistoric, for the boy, without troubling to ask who the stranger was, took a dart "out of his pocket", hurled it, and hit him. The man in the boat happened to be Balor. Thus, in accordance with the prophecy, he was slain by his grandson, who, though the folk-tale does not name him, was obviously Lugh. Where Next . . . Overall, lots to think on and a much more digging needed to see if the pieces might add up to a puzzle.